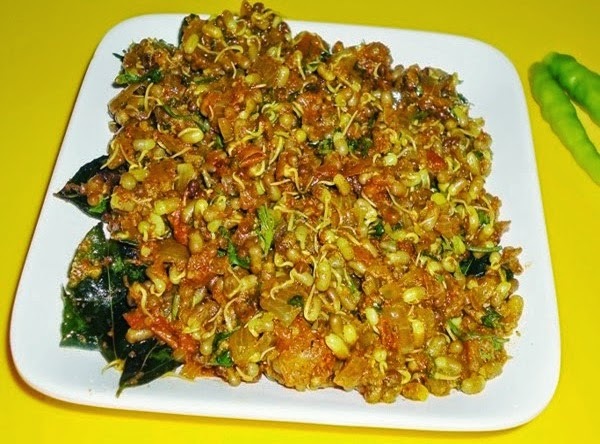 Matkichi usal recipe - Sprouted matki usal made using Kala Masala is a healthy and delicious dish. 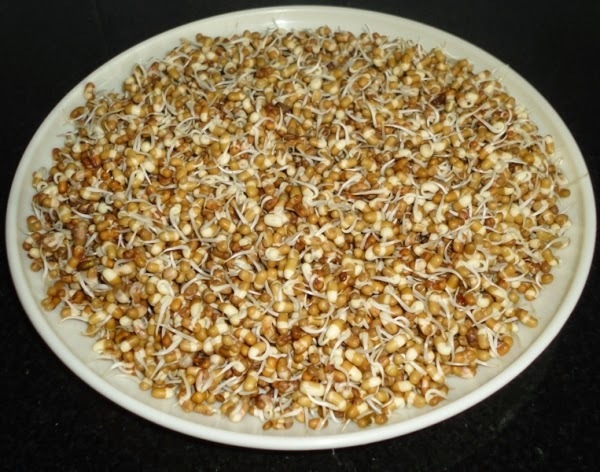 We all know that sprouted lentils have several nutrients which are beneficial to our body. 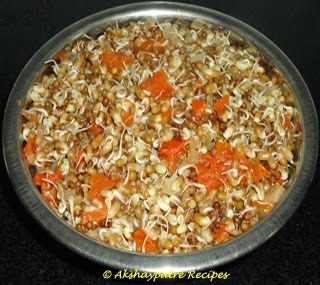 Therefore, its recommended for all age people to include usal or dish made with various sprouted lentils, such as sprouted moong, chickpeas, vaal, abzuki, black eyed beans etc. at least in four meals in a week. This type of usal can also be made using mixed sprouted lentils or beans. Wash the sprouted moth beans gently, drain the water and set aside. Boil the moth beans with 2-3 tbsp of chopped onion, chopped tomato and salt along with some water. Cook till the matki turns soft, but not too soft. Heat oil in a pan. 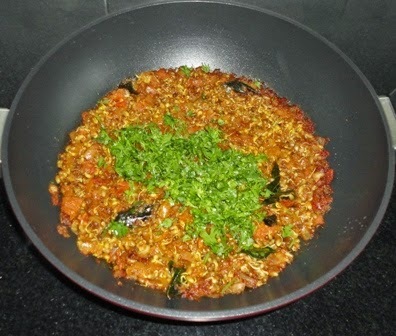 Add the curry leaves and saute for few seconds. Add the onion and fry till translucent. Grind the ingredients mentioned under "grind to paste" to a smooth paste. Add the ground paste. 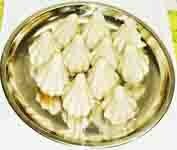 Add the above prepared boiled matki along with water. Add the salt. Mix well and cook covered on low flame or 5 minutes or till the water dries up. Serve the matki usal hot as a side dish. 1. Wash the sprouted moth beans gently, drain the water and set aside. 2. Boil the moth beans with 2-3 tbsp of chopped onion, chopped tomato and salt along with some water. Cook till the matki turns soft, but not too soft. 3. Heat oil in a pan. 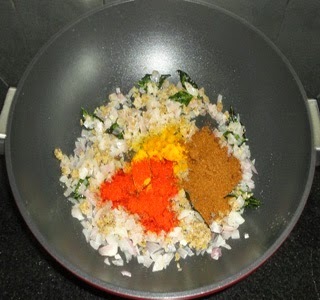 Add the curry leaves and saute for few seconds. Add the onion and fry till translucent. 5. Grind the ingredients mentioned under "grind to paste" to a smooth paste. 6. Add the ground paste. Add the above prepared boiled matki along with water. 7. Add the salt. Mix well and cook covered on low flame or 5 minutes or till the water dries up. 8. 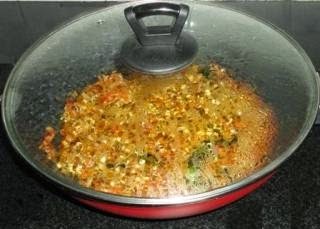 Add chopped coriander leaves and mix well. 9. Serve the matki usal hot as a side dish. 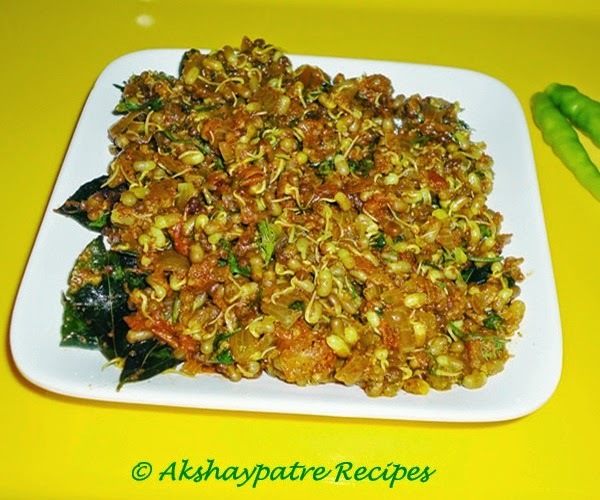 healthy twist to popular dish. visit me sometimes dear. Protein packed and yummy dish! Healthy Protein rich dish. Yummy side dish.